Printed microfine capillary blood vessels are now possible, thanks to researchers at the Fraunhofer Institute. These structures will be needed to supply the larger artificial biological structures that have already been created (see Human Vein Bioprinted In 3D and World's First Artificial Human Liver Grown In Lab). A 3-D inkjet printer can generate 3-dimensional solids from a wide variety of materials very quickly. It applies the material in layers of defined shape and these layers are chemically bonded by UV radiation. This already creates microstructures, but 3-D printing technology is still too imprecise for the fine structures of capillary vessels. This is why these researchers combine this technology with two-photon polymerization. Brief but intensive laser impulses impact the material and stimulate the molecules in a very small focus point so that crosslinking of the molecules occurs. 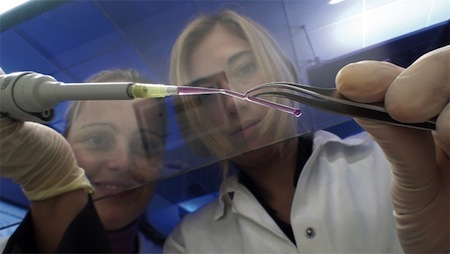 The material becomes an elastic solid, due to the properties of the precursor molecules that have been adjusted by the chemists in the project team. In this way highly precise, elastic structures are built according to a 3-dimensional building plan. The scientists integrate modified biomolecules – such as heparin and anchor peptides – into the inside walls. They also develop inks made of hybrid materials that contain a mixture of synthetic polymers and biomolecules right from the beginning. The second step is where endothelial cells that form the innermost wall layer of each vessel in the body can attach themselves in the tube systems.